Leftover rotisserie chicken, kale salad with a sesame vinaigrette, baby carrots, roasted rosemary almonds and a happy tangerine. 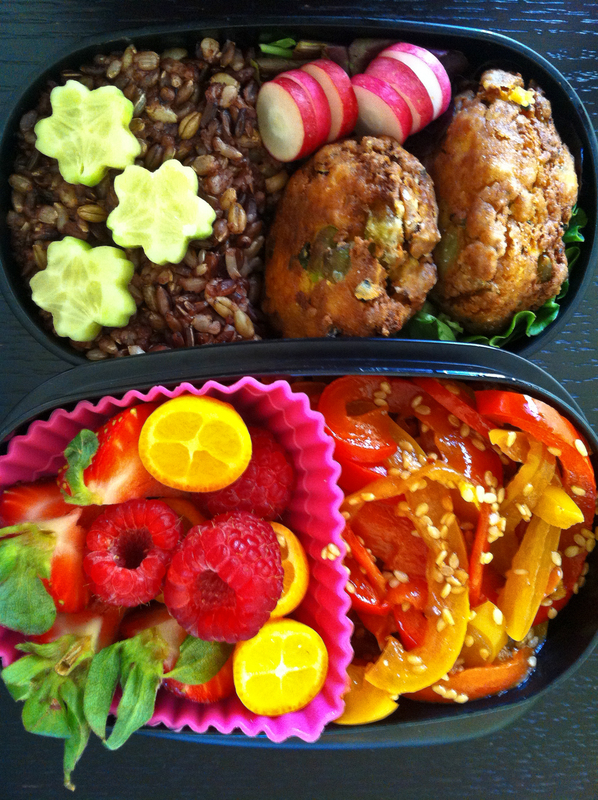 This entry was posted in Bento, California and tagged bento box. 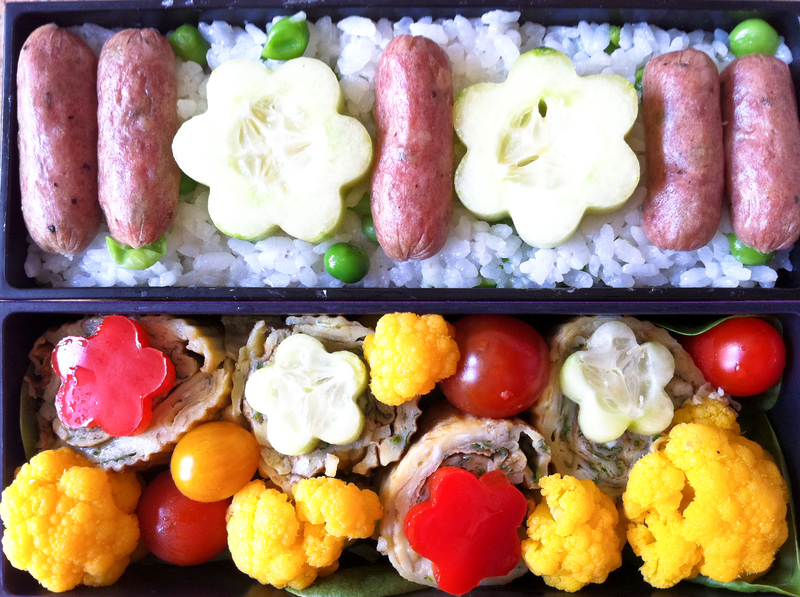 Chicken and apple mini sausages and cucumbers over white rice with peas; cilantro tamagoyaki (omelette roll), steamed cauliflower, grape tomatoes and veggie flowers on a bed of baby spinach leaves. After an action-packed weekend of friends and family, academics and a capella, my fridge is looking pretty bare. So between my last few eggs, some cilantro on the verge, leftover rice and an old bag of frozen mini-sausages, I cobbled together this bento. Not too shabby, if I do say so myself, though I’m looking forward to going to the grocery store tonight. 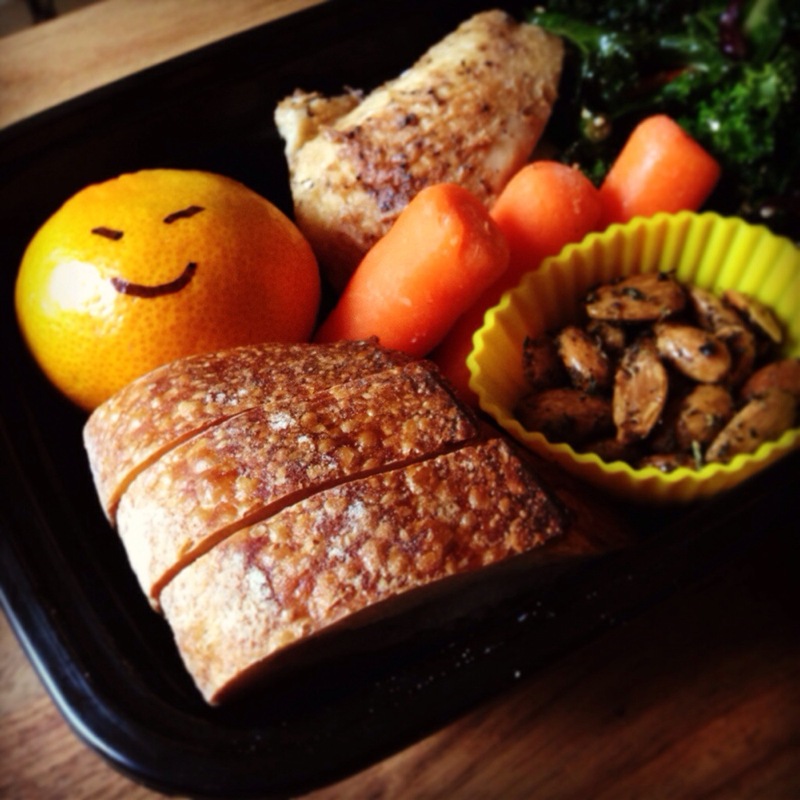 This entry was posted in Bento and tagged bento, bento box, mini sausages, tamagoyaki. 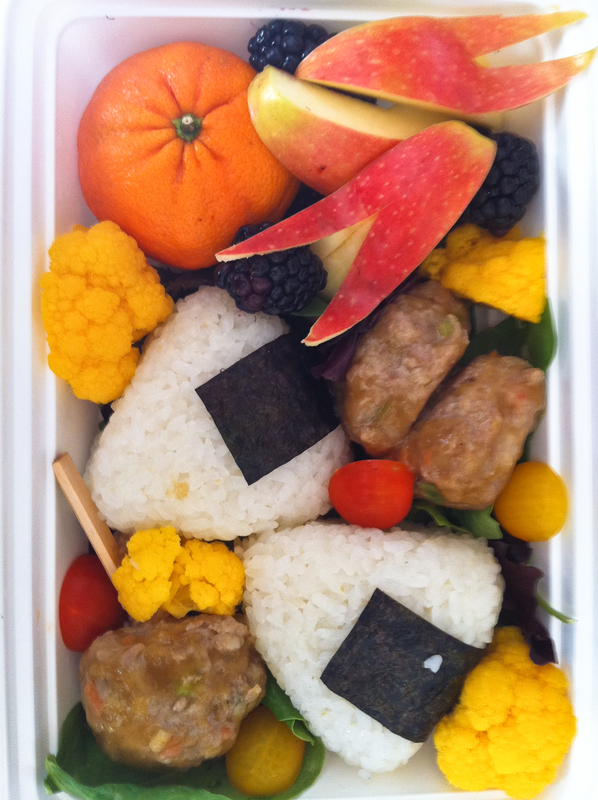 In a nod to my busy day, yesterday’s pork and shrimp balls have resurfaced in another bento today. This time, I paired them with finger foods and items you could eat by stabbing them with my cute little wooden picks! 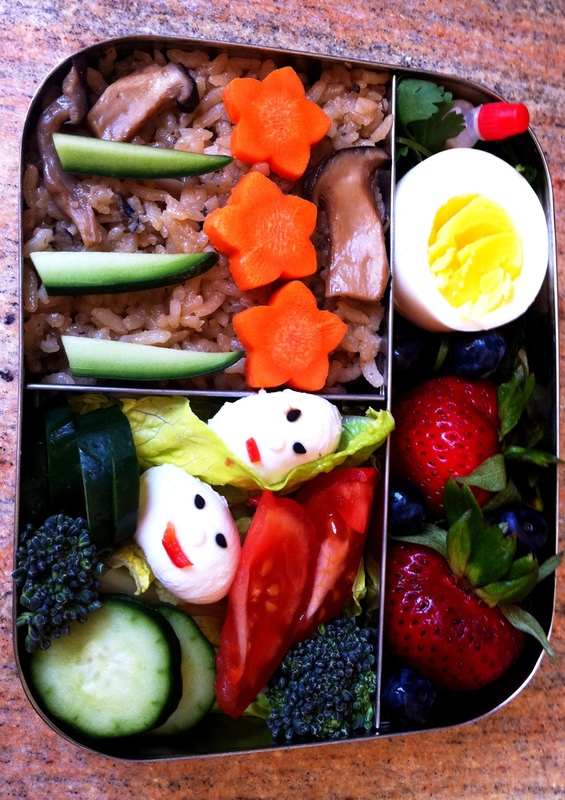 This entry was posted in Bento and tagged bento, bento box. Steamed shrimp and pork meatballs with steamed asparagus, baby tomatoes, radish flowers and a fruit cup; a bed of multigrain rice sits below. It’s been a crazy few weeks with lots of travel and some new deadlines. I’m trying to limit my extracurricular activities until this project is done! But I can’t stop bento-ing, or exercising for that matter. So here’s one I made because the meatballs could be done in the microwave without sacrificing taste! 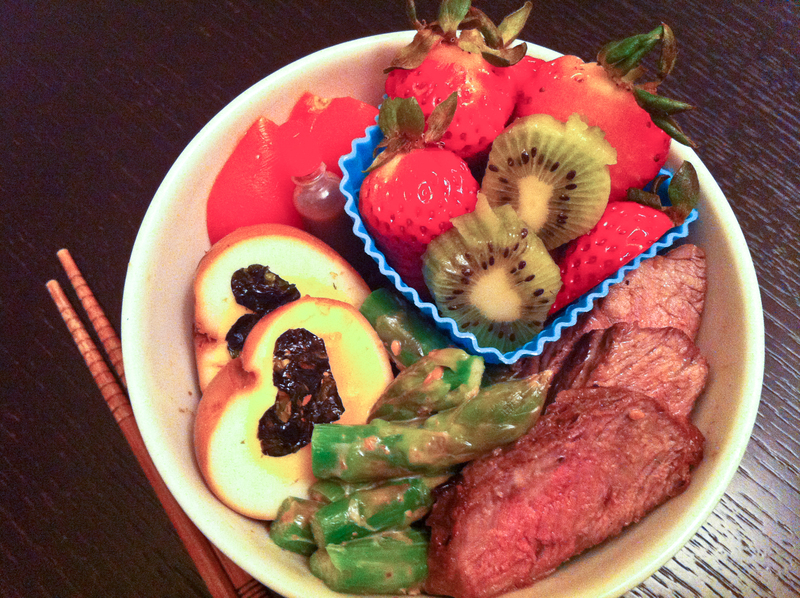 Props to Makiko Itoh for the awesome recipe. 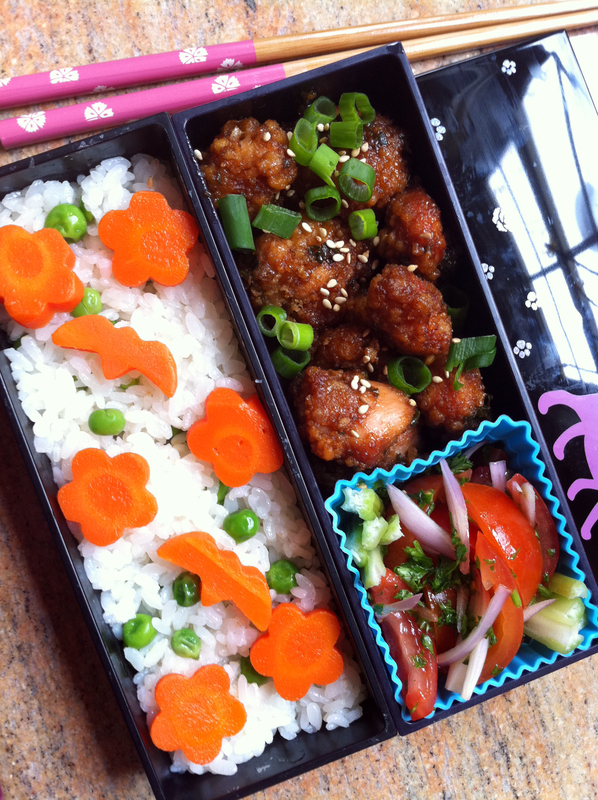 You can find it in The Just Bento Cookbook, which is kind of like a newbie bento-maker’s bible! 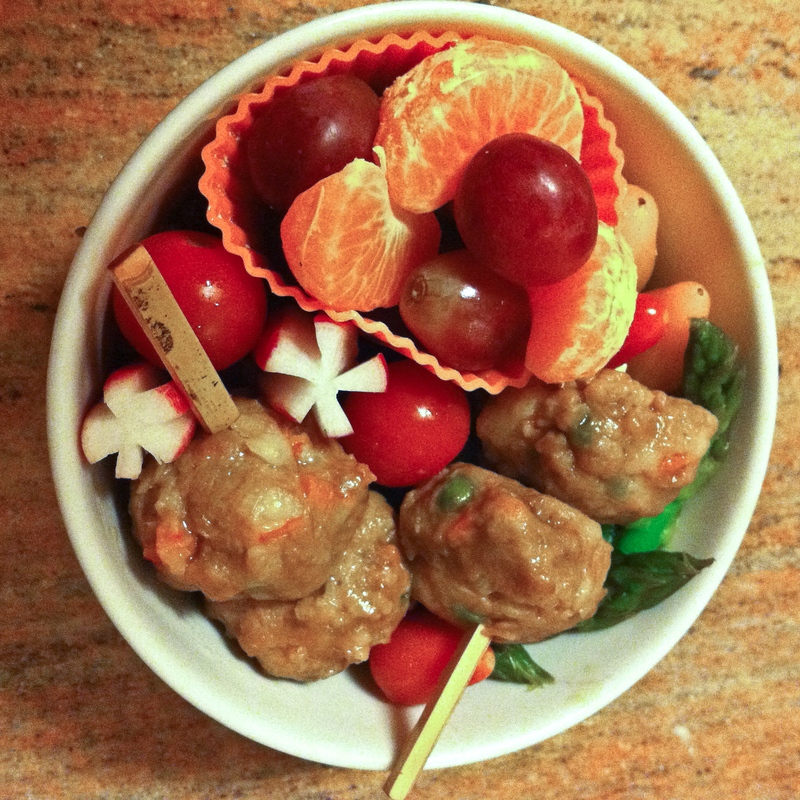 This entry was posted in Bento and tagged bento, bento box, Just Bento Cookbook, sweet and sour shrimp and pork balls. 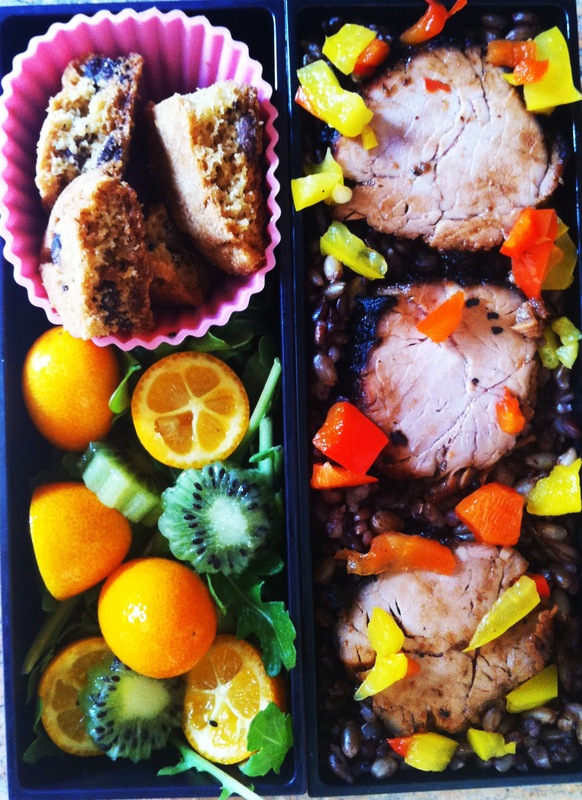 This entry was posted in Bento and tagged bento, bento box, miso pork. This bento is a bit busier than I would like. Think I got carried away since it’s Saturday, and time was less of an issue than during the week. I used a flower-shaped cookie cutter for the egg and rolled the ham into a “rose,” My baby spinach leaves, however, kind of got lost in the mix. Dressed up the waffles with cheese and ham flowers and tossed in a “bottle” of real maple syrup. Plan to sprinkle the pecans and fruit on top. It was silly but amusing to cut my strawberry into a strawberry shape with a cookie cutter. Very meta, no? 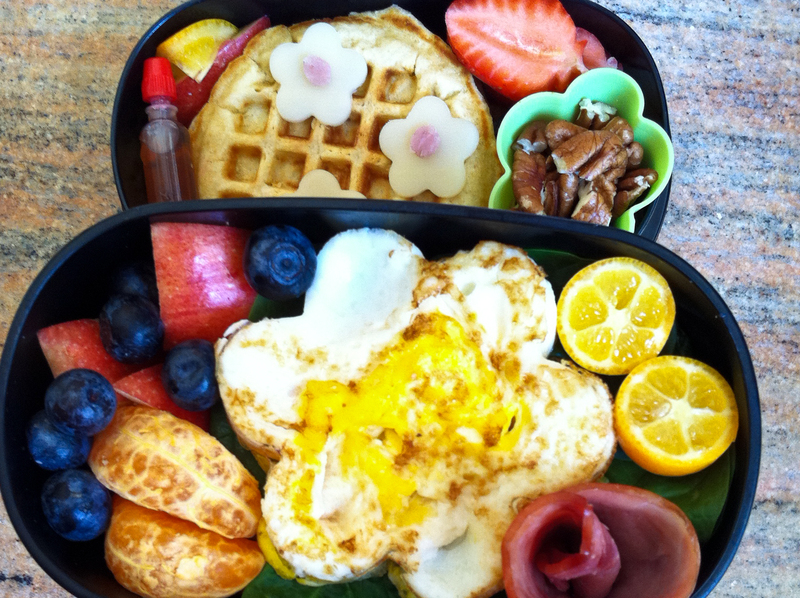 This entry was posted in Bento and tagged bento, bento box, brunch, eggs, ham, kumquats.